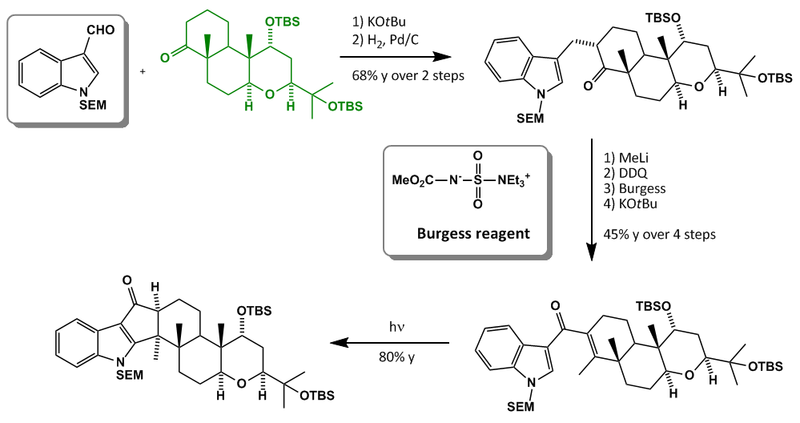 As the title suggests it’s time for some sunlight chemistry… Ok only one step but the rest of the synthesis is also worth reading. The Terpendoles are a family of indoleterpenes which show weak activity as acyl-CoA:cholesterol acyltransferase inhibitors. Recently it was discovered that the terpendoles inhibit the kinesin spindle protein (KSP). In this paper the synthesis of one member of this class is described. The retro is rather short as the paper is, too. We’re starting with some FGI and cut the molecule into two halves by using the above mentioned Nazarov cyclization strategy. As can easily be seen, the molecule should be accessible directly from the known Wieland-Miescher-ketone. The scheme starts with a selective protection of the unconjugated carbonyl. Phenylthiomethylation (search for Kirk-Petrow-reaction for further information) which was followed by a SET reduction under Birch conditions and subsequent trapping of the anion with allylbromide then yields the allylated/methylated ketone. LAH reduction of the remaining ketone, boronation of the terminal olefin and oxidation results in lactone formation. Oxidation of the ketone lactone to an α-β-unsatured one was achieved under more or less unconventional conditions. Epoxidation with H2O2, epoxide opening with phenylselenide and protection of the resulting alcohol as the MOM ether closes the first scheme. The first few steps should be clear. 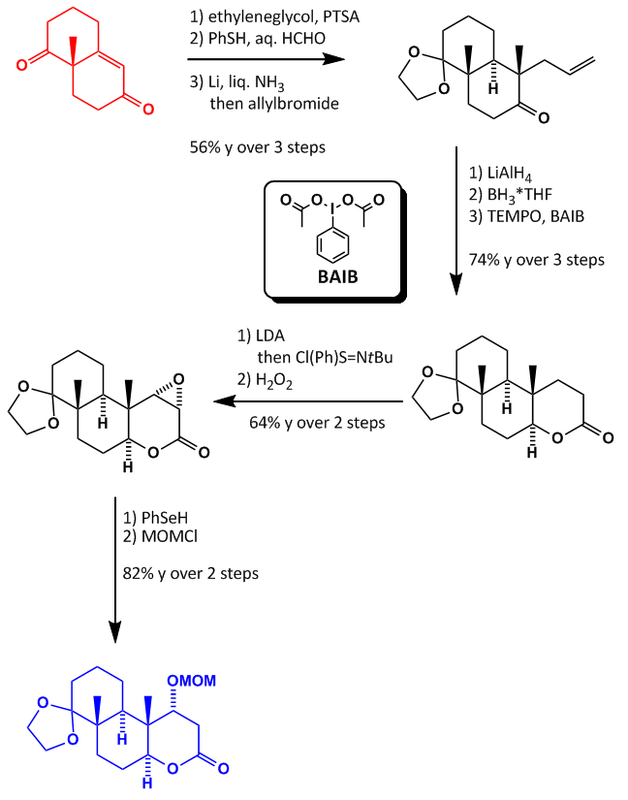 The Birch reduction step might involve an intermediate radical anion which is trapped by allylbromide and reprotonated under thermodynamic control. This is only a proposal of what I think the mechanism might be… I’m open for better ideas or corrections. With the blue intermediate in hand we can move on. Selective reduction of the lactone was achieved with DIBAL-H and the aldehyde olefinated. Epoxidation of the alkene with mCPBA was followed by Sc(III) mediated pyran formation, oxidation and epimerization of the isomeric ethers to give one single pyran ring. Grignard reaction with methylmagnesium chloride, PG interconversion and acetal cleavage sets the stage for the final few steps. The first step involves an aldol condensation/hydrogenation to link both halves of the molecule together. Methylation of the ketone, benzylic oxidation with DDQ, dehydration of the tertiary alcohol with Burgess reagent to the exocyclic alkene and isomerization of the latter one to the endocyclic alkene prepares the key intermediate for the Nazarov cyclization. This [2+2] cyclization was mediated by UV light and closes the ring in a disrotatory manner. 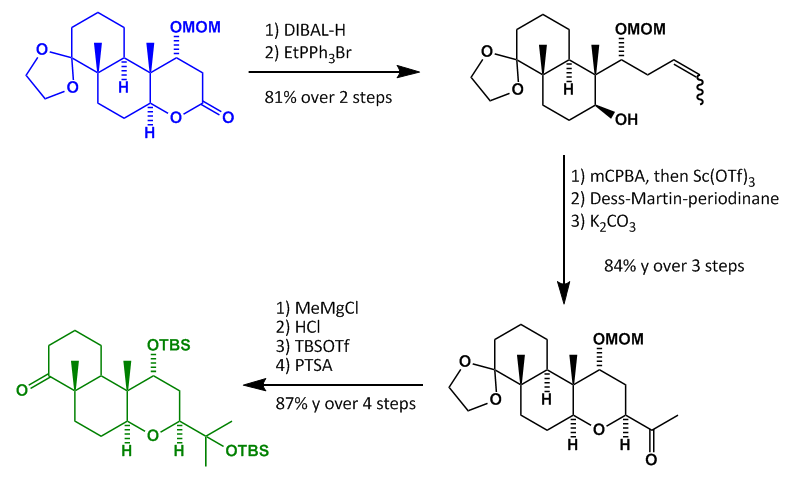 Protecting group removal and complete reduction of the ketone then yields Terpendole E.
Another sweet paper from the Hanessian group published in August featuring a bunch of nice biological active compounds. Especially Oidiolactone B exhibits an impressive activity against interleukin-1β which could potentially be used for treatment of inflammatory diseases (http://en.wikipedia.org/wiki/Interleukin). They planned to install the C ring at least and decorating the starting decaline core with some well established methods for example a sweet Reformatzky and Baylis-Hillmann reaction, both a bit underdeveloped in total synthesis. 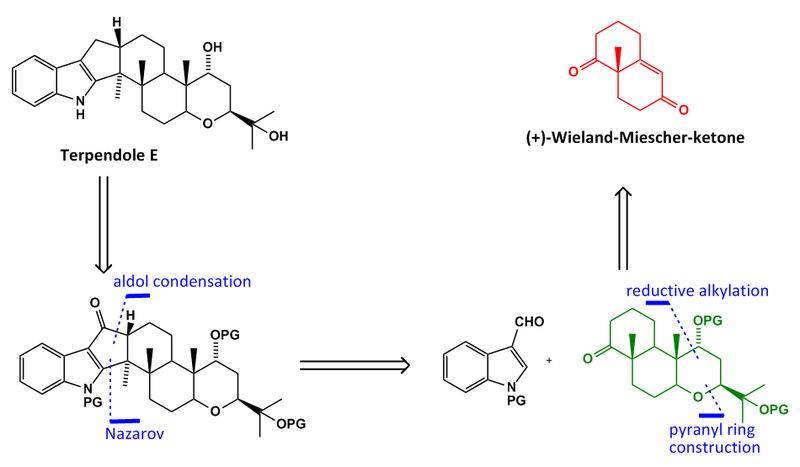 First some protection and then a nice radical conjugate reduction under Birch conditions quenched with Mander’s reagent to give the methoxycarbonyl side chain in good yield and dr (which is unimportant because it is destroyed in the next step). 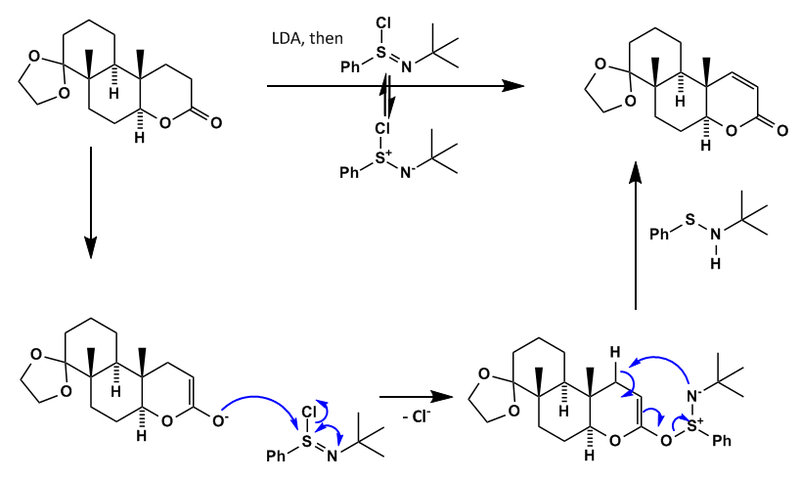 Triflate formation and Stille like reduction gave them the unsatured ester which was again reduced with single electron transfer as I suppose (or maybe by facial selective hydrogen addition? ), followed by alkylation and deprotection. 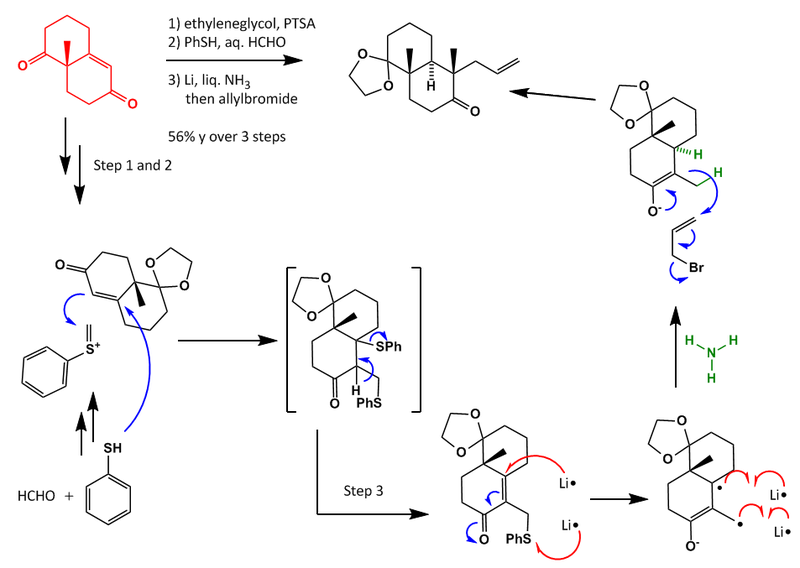 A highly efficient IBX mediated dehydrogenation was followed by deprotection of the ester to give the blue intermediate. Didn’t know the IBX dehydrogenation method, I would have used a Saegusa type reaction but this one seems to be more practical. A highly efficient phosphine catalysed Baylis-Hillmann reaction with formaldehyde was followed by a bromolactonization to close the D ring lactone through the shown transition state. TES protection and a nice catalytic Reformatzky reaction furnished the key intermediate in an impressive overall yield of 17% over 14 steps. The biggest problem poses the dehydration to form the exomethylen ester group. This problem was solved employing Burgess reagent to dehydrate the hydroxy function off the ring. After having the dehydration problem solved they commenced with HF mediated deprotection/ in situ lactonisation followed by DMDO epoxidation to give Oidiolactone C.
To improve the yield they switched the order of events and got the product in a much better yield. With the epoxidated decaline in hand a mild TES deprotection by CSA, DMP oxidation and strong acid catalysed lactolisation gave then a mixture of epimers of Oidiolactone D.
This was methylated to give Oidiolactone A. Starting with the already employed CSA mediated deprotection and DMP oxidation, followed by Burgess dehydration and acidic lactolisation to give the fourth natural product in this paper. 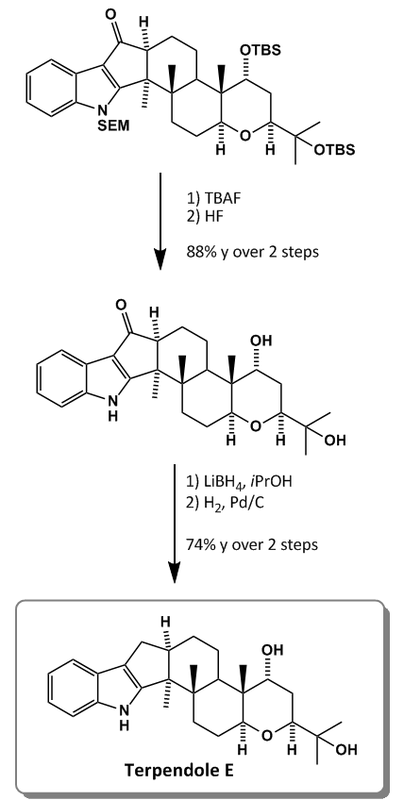 A described access to Nagilactone F through isopropylgrignard addition gave only low yield and moderate diastereoselectivity, so they worked their way through a more commonly isopropylengrignard reaction reaction followed by a modified Wilkinson reduction to give Nagilactone F in a much better yield and diastereoselectivity. Oidiolactone B, the most potent member of this class, was easily accessible by methyl acetal formartion and separation of the desired major isomer. You are advised to have a look in it. I enjoyed most the smooth preparation of the key intermediate.